March 3rd, 2016 was a day that turned Barbara Overton’s life around forever. Barbara had planned 3 days of skiing in the Colorado mountains with her family... or so she thought. Here Barbara was 56 years young, in good health and suddenly found herself in intensive care with a heart attack. This would be the first of two heart attacks she would experience in the same month. Barbara did not have a typical heart attack but a Spontaneous Coronary Artery Dissection (SCAD) heart attack, an emergency condition that occurs when a tear forms in a blood vessel in the heart. After being released from the hospital, Barbara was told she had to go through cardiac rehab. She eagerly searched for somewhere that would not only get her heart back in shape but also the rest of her body. A good friend of the family had success from their time at Whole Body Fitness, and Barbara was impressed by their results. “I thought I would give it a try and convinced the hubby to go with me, he could use a little shaping up also!” said Barbara. And so, Barbara and her husband Greg Overton began their journey back to health. They first met with Natalie their nutritionist and were blown away by the diet program. Barbara loved how encouraging Natalie was and all of the advice she gave along the way. The couple felt that the program was very easy to maneuver through and had everything they needed to keep on track. Greg loved that when he had questions about the different phases, Natalie was there to help him every step of the way. “For me, the plan incorporates the right amount of food intake, so you don’t feel like you’re always hungry,” said Greg. The couple also really enjoyed the group of people that they worked out with, and how the program was more personalized due to the size of the group. Barbara is a manager at a very fast-paced processing facility that has a lot of ups and downs, and at times is a very stressful job. This program has helped her focus more on her health and realize that being healthy and taking care of herself will help her manage her everyday life much better. “I have a better attitude and as my kids put it. I have learned to just relax and take time for me,” says Barbara. Greg is an Almond Farmer, and like all Farmers, he is up very early. He loved how the 5:30 am class gets your body ramped up for the day's job ahead. “I had seen first hand at how successful the program worked for two family friends. My goal of reducing body fat, and increasing mobility have come true not like other programs I have tried,” says Greg. For Barbara, the most challenging part of this program was sticking to it. “I have to say my wife made me do this class with her! Without my support, she would not have done this program. She is famous for starting something and not finishing it.” says Greg. Barbara can’t thank her husband enough for being her driving force in all of this. Today, Barbara has lost a total of 20 lbs and feels great! “I would and have recommended this program to family and friends as now most of Greg’s family is in the program today. They have seen the awesome results that Greg and I have accomplished and now know that they can also get there! Family and friends are amazed at how better we look and feel!” exclaims Barbara. For Greg, he has lost a total of 37 lbs, has increased his flexibility and also feels great! “Working with Taylor C our trainer is great. He is so informative. He helps you with solutions to correct problems in your posture or old injuries that I had acquired. He makes the class fun and challenging at the same time, while you rediscover those lost muscle groups.” explains Greg. 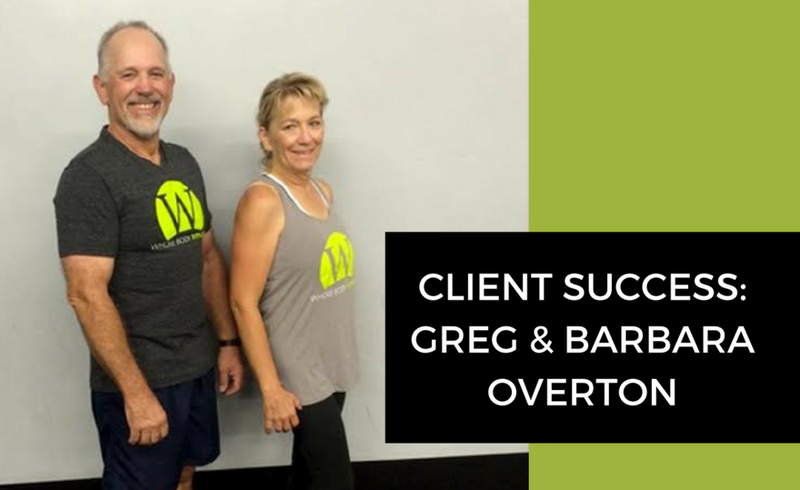 We are so proud of Greg and Barbara's success, and can't wait to see them continue to work toward a healthier lifestyle! Keep up the good work Greg and Barbara! It’s becoming more and more of a cliché around here. The more athletes I train, the more injuries I hear about that originated “in the gym” training for their sport. Why? It’s the same reason for golfers as it is for any other sports participant; in reaching for athletic excellence they followed out dated advice. Lets speak strictly “athletically” and leave technique, experience, and the ability to maintain mental focus under pressure (all abilities necessary to excel as a golfer) off the table for a moment. What makes the ultimate physical athlete? What should the Zeus of golf look like and be able to perform? Massive upper body strength? Gymnast like flexibility? No.. The elite golfer needs to achieve one thing. A body that functions as it was originally designed. All the joints, bones, and muscles in proper alignment working together as a functional unit. In this position an athlete’s body works together and has the greatest capacity for power, stability, balance and of most concern to the golfer, reliable and predictable movement. We call this “neutral anatomical alignment.” An athlete who achieves this has all the tools necessary to maximize their potential. While following the rules governing human movement and muscular balance we manage to develop a physique with greater strength, speed, and power.. Great! But BE CAUTIOUS, if achieving greater strength and power comes at the expense of violating the body’s innate blueprint for functionality, your athletic ability and possibly structural integrity will be compromised. For starters, Americans (and most industrialized nations) are already starting at a cultural disadvantage functionally speaking. Understanding this is absolutely vital to reaching your potential athletically. The human body has muscles responsible for postural integrity, fluid motion, and general maintenance of full range movement. Nearly all of us have crucial muscles and stabilizers that have atrophied (weakened) as well as over taxed hypertonic (shortened and tight) postural muscles trying to do the job of their weakened counter parts. This goes for both the couch potato and the muscle bound jock alike. There are many reasons for this in our society but a simple one that most people can relate to is as plain as the chairs we sit in. Our bodies are designed for motion. Only in movement are our bodies maintained and calibrated to our original functional blue print. But we are a nation of professional sitters. We sit to work, we sit to travel, we sit to recreate, we sit to eat, we sit to rest, and likely as you’re reading this... you’re sitting. This culture forces our bodies to execute one of the programs it’s best designed for: adaption. Our bodies are constantly in a state of adaption to both internal and external stimulation. If we run regularly, our lungs and cardiovascular systems adapt to become more efficient. If we eat too much, our bodies store the extra fuel in areas that allow us to (usually) manage the extra weight until we are somewhat plump. Imagine if we were to store all our excess body fat in our ankles and wrists.. we would become prohibitively clumsy. No, our bodies adapt to withstand the demands placed upon it. Even our skin adapts to manage greater sun exposure. Humans as a culture and generation are once again adapting to the demands of our life style and it’s not for the better. Our culture forces adaptive responses in the major axis of the body (the pelvis) and extends to the common mis-alignments we see nearly everywhere, sagging forward rolled shoulders and head, rounded upper backs, turned out feet, to name a few. Don’t believe me... open you’re eyes. It’s an epidemic that’s particularly worrisome amongst our youth. It’s everywhere. Do you suppose our bodies could be so mis-shaped and out of alignment without the muscles and joints being severely compromised? Of course not. Now you the athlete are deciding which of the latest “improve your swing” exercises is going to help you drive 50 yards further down the fairway. Please listen. I work with some of the top athletes in the world across multiple sports and have been amazed at the endurance of faulty belief systems in nearly all sports. You are asking the wrong question! What you need to be asking yourself is, how do I restore my body to it’s original functionality, before our “lifestyle” eroded it’s balance and alignment? If you can answer this question reasonably then you’re already ahead of most trainers in the gym. Now your time in the gym, stretching, and training will be well worth your investment. Anything else will likely contribute further to muscular imbalances, further compromise of your joints, reduced range of motion, and make you more susceptible to injury. But there is good news for golfers and anyone wanting their bodies to “thrive”. While I always feel time and resources spent with experienced professionals trained to identify weaknesses in your body (not just the beach muscles) is a worthy investment, basic logic and a few simple principles can go a long way in allowing an athlete to make good choices about their conditioning on their own. First take an honest look in the mirror. Stop sucking in your gut, don’t puff out your chest and quit zeroing in on the veins in your forearm. They will do nothing to hold your spine erect, head in the neutral position, or help you swing your clubs with precision and reliability. I want you to just relax. View your posture from the side. Even without a plumb line or advanced measuring instruments you will be able to see where your body is sagging, drooping, rolling, or rotating. Every bone in your body is being held in place by muscles, ligaments, and tendons. Picture a circus tent withcables holding the giant poles in place. If some of the cables are tighter and shorter on one side and weaker on the other the pole and everything attached to it will lean and sag. That’s what’s happening to your spine and subsequent bones and structure. No wonder our junior high aged sons are already walking duck footed and our high school aged daughters have forward rounded shoulders and a head that sinks down. We’ve conditioned our bodies to get used to weak and shortened muscles. Now back to the mirror. If from the side our shoulders slump forward try this: Roll your shoulders further forward, feel what muscles are working to bring them forward, then return them back in line with our ankles (like a greek statue). Take a moment in this position (shoulders drawn back) and feel what muscles are working in order to hold them there. It’s easy to assess what muscles have become dominant in that game of tug of war. If you’re like 95% of the clients I see on a daily basis it’s likely that your chest (anterior) muscles have won the war. The muscles in your upper back (posterior) have long since surrendered with flailing white flags and yielded possession of your shoulder girdle to the overpowering anterior nations. Precious landscape on your body has been conceded as terms of surrender to allow your body to continue functioning. Your head has migrated forward and south, your pelvis has traveled distant from it’s original position to bear the load and your feet have rotated apart to manage the new partitioning. In short, you’ve been conquered. Lets apply some critical thinking at this point. If this describes to some degree what you see in the mirror, how logical would it be to further develop your anterior muscles (the already over powering force in your body)? Yet this is exactly what I see in 99.9% of athletic programs I critically evaluate. Please stop doing this. Your body is begging you. What exercises should I focus on for improved athletic performance? The answer depends on how close you are to the initial goal of “neutral alignment”. If you are in good alignment then your body is prepared for any regime that is balanced and thoughtfully designed. If your body is still “out of phase” (mis-aligned) then you need to incorporate exercises that directly strengthen the weakened muscles in your body. Simultaneously it’s critical to avoid additional development of the muscle groups that are causing your body to drift further from it’s original blueprint. Next time you kneel down for that last set of .... ask yourself why? Will it strengthen a muscle group that will directly contribute to improved muscle balance throughout my body? Will it’s effect directly translate to improved performance in my sport? Will it overdevelop muscles that are already dominating within my musculature? By considering our training’s impact on our body’s alignment (and therefore our functionality), we put ourselves in line for the best possible outcome.